316 pages | 37 B/W Illus. The human mind is both extraordinary and compelling. But this is more than a collection of case studies; it is a selection of stories that illustrate some of the most extreme forms of human behaviour. From the leader who convinced his followers to kill themselves to the man who lost his memory; from the boy who was brought up as a girl to the woman with several personalities, Geoff Rolls illustrates some of the most fundamental tenets of psychology. Each case study has provided invaluable insights for scholars and researchers, and amazed the public at large. Several have been the inspiration for works of fiction, for example the story of Kim Peek, the real Rain Man. This new edition features three new case studies, including the story of Charles Decker, who was tried for the attempted murder of two people but acquitted on the basis of a neurological condition, and Dorothy Martin, whose persisting belief in an impending alien invasion is an illuminating example of cognitive dissonance. In addition, each case study is contextualized with more typical behaviour, while the latest thinking in each sub-field is also discussed. 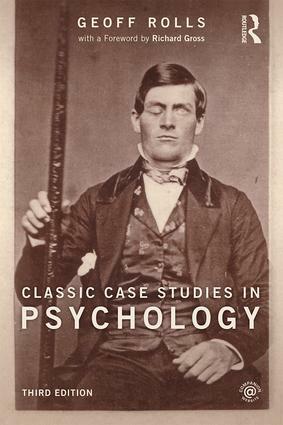 Classic Case Studies in Psychology is accessibly written and requires no prior knowledge of psychology, just an interest in the human condition. It is a book that will amaze, sometimes disturb, but above all enlighten its readers. Geoff Rolls is Head of Psychology at Peter Symonds College in Winchester and formerly a Research Fellow at Southampton University, UK.